Complaining about “fake news” has been one of Donald Trump’s favorite activities, posting 210 tweets griping about “fake news” in 2018 alone, according to a CNN tabulation. That total does not include the number of times Trump attacked the news media as “fake” in his other public statements and speeches. But a new analysis by a leading technology news site has found that Trump’s own Instagram and other social media accounts contain not just fake news, but may also contain fake — or digitally altered — images of Trump. The images in question may appear to have been manipulated to make Trump appear more handsome and physically fit. In one instance, the alleged alterations address an area that Trump, as ABC News has documented, has long been particularly sensitive about — the size of his hands. In the 1980s, satirical magazine Spy wrote frequently about Trump, generally referring to him as a “short-fingered vulgarian.” Vanity Fair has documented the origins of the phrase, but it has long hit a nerve with Trump, and it shows in his apparently altered social media posts. 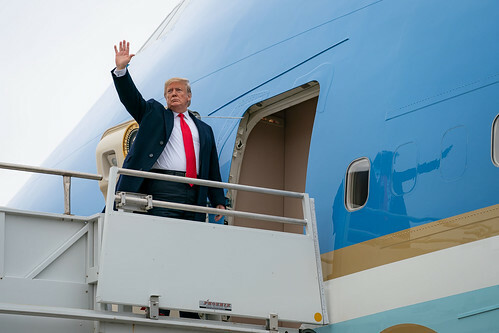 As a video by the tech site Gizmodo — which claims to have discovered a repeated digital manipulation of Trump’s social media photos — reveals, one such photo was altered to make Trump’s index finger appear significantly longer than it actually is. One such video is hosted by Kinja. 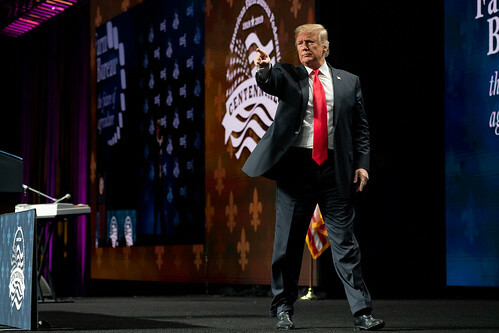 In fact, as seen below, the full photo of Trump pointing — posted to his official Facebook account on January 17 — has apparently been altered to make Trump appear trimmer, giving him a better-defined jawline as well. The original, purportedly unaltered version of the photo was taken on January 14, Gizmodo found. The image in question was posted to the official, public domain White House Flickr account. Gizmodo journalist Matt Novak also found the below photo posted on October 3 of last year to Trump’s official Facebook page — again showing Trump pointing — and with his index finger altered to appear longer than it actually is. The original photo, taken in June of 2016, appears below. Novak put together another video showing the alterations between the original Getty Images photo from 2016 and the Trump Facebook page version, which may be viewed via Kinja. Novak also found that in the Facebook photo — seen below, as posted to Trump’s account on January 18 — his stomach has been tightened to make him appear more trim than he actually is. The original appeared on the White House Flickr account. The Gizmodo video, again hosted by Kinja, shows Trump’s digital slimming more clearly.